And with the year 2013 in full swing now, we are gering up for many more sci-fi films with ‘Elysium’, ‘Pacific Rim’, and ‘Star Trek Into Darkness’, just to name a few. And to start this pre summer craze of epic films, director Joseph Kosinski, whose only previous film credit is the sequel to ‘Tron’, was given the keys to make a mega budget science-fiction movie, starring Tom Cruise. I have no doubt this will make tons of money at the box office, however most people might have a mixed taste of sweet and sour once leaving the theater. Much like how ‘The Lord of the Rings’ started, we get a detailed recap of the last 60 years on Earth narrated by Tom Cruise’s character Jack Harper. (Cruise’s previous character’s name was Jack Reacher. No relation.) Jack tells us how aliens attacked earth and our moon, which caused heavy natural disasters to pretty much wiped out the planet and its humans. However, the survivors fought back and decided to use nukes to kill off the aliens. Well it “worked”, but it destroyed the planet. Now, the humans live in a giant space station and is taking all of Earth’s natural resources for energy to transfer onto a new planet. Jack’s job is to make sure these giant machines do their job without getting destroyed by leftover aliens, who are referred to as scavengers. To Help Jack out on his missions, he is assisted by robotic drones, which are a blatant rip off of Eve from ‘Wall-E’ and the robots from the video game ‘Portal’. These drones talk, have unlimited fire power, can travel fast, and are extremely hard to kill. And what do all of these drones have for a camera and voice box? That famous red eye camera, made famous in Stanley Kubrick’s ‘2001: A Space Odyssey’. When Jack finally meets up with Malcolm Beech (Morgan Freeman), I thought I was seeing an older Morpheus from ‘The Matrix’ films as their costumes, appearance, and characters stood for and did wanted the same things. There’s a point during the film where you just say, “Okay, I get you are paying your respects to the classic sci-fi films, but let’s do something original.” I can easily name several other instances and other sci-fi films that ‘Oblivion’ pays homage to, but I don’t want to ruin the surprises or lack thereof, as you can see some fo the twists and turns coming from a parsec away. This is not a typical all out action film with tons of futuristic guns blazing non-stop and spaceship chases. No, this more of slower paced, character driven film, which at times seems to overstay its welcome just a tiny bit too long. I don’t mind a slower paced film, but when it travels in circles and we end up doing the same thing again is where I seem to lose interest. That being said, the film itself is a marvel to see on the big screen. It’s quite beautiful to look at on screen, even with it’s desolate landscapes. The futuristic flying machines, guns, and other objects are all done well, with some pretty spectacular effects. I also saw ‘Oblivion’ with the new Dolby Atmos sound system, which might be the best sound I have ever heard during a film. Dolby Atmos gets rid of the usual channel set-up such as a 5.1 or even 17.1 set up and has around 64 speakers in the theater that line the side walls, the back walls and all over the ceiling above you. Each speaker is independently controlled and smoothly and flawlessly pours out the sound individually. It was a great experience, and if you have a Dolby Atmos equipped theater near you, I highly recommend seeing it there. Tom Cruise does a decent enough job here playing a guy who is slowly figuring things are not what they seem. However I thought his characters in ‘Jack Reacher’ and the latest ‘Mission Impossible’ film had more depth and were more entertaining to watch. Morgan Freeman is always great to see on screen, and he is great here, but feels a bit underused and doesn’t have enough screen time. Cruise has two female co-stars here with Andrea Riseborough and Olga Kurylenko turning in solid performances, but ultimately forgettable. It was great to see Melissa Leo in the mix as well as Nikolaj Coster-Waldau (Jaime Lannister from ‘Game of Thrones’) and Zoe Bell (‘Death Proof’) show up in their tiny roles. 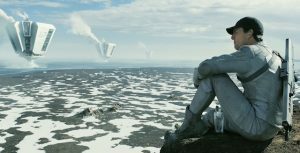 ‘Oblivion’ is visually stunning film, one that should be seen on the big screen. It falls short in the way of story telling and wanting to be an original sci-fi film. You can’t make a quality movie by putting together your favorite aspects of previous films and expect it to be coherent. The score was well rounded and packed a punch throughout and was even a bit similar to Kosinski’s previous sequel film ‘Tron’. 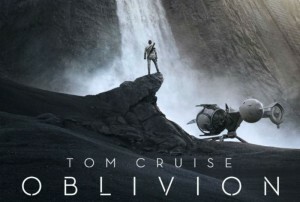 If you are a fan of science-fiction, you’ll want to see ‘Oblivion’, even if its flaws outweigh its strengths. This entry was posted on Friday, April 19th, 2013 at 1:50 am	and is filed under Film, News. You can follow any responses to this entry through the RSS 2.0 feed. You can skip to the end and leave a response. Pinging is currently not allowed. Great review Bryan. The story is stretched thin and at times simplistic, but is salvages somewhat by the performances. Although, I do have to say that Cruise gives this role his 100% effort to work. It does, but the rest of the movie doesn’t. Dan, I thought Cruise did a decent job in his role, but it wasn’t his most stand out. I’ve seen better from him. Thanks Marc. Yeah, this blu-ray is going to be badass. « Hollywood is Remaking ‘Weird Science’! !